Home / Uber / Uber vehicle requirements: Can you drive for Uber with your car? Uber vehicle requirements: Can you drive for Uber with your car? Of all the questions I get from people who want to become Uber drivers, the most common one is, “Can I drive for Uber with my car? Does my car qualify? ” The first step is to find out if your current car meets the requirements of any of the Uber services. If it looks like your car qualifies, the best next step is to apply to become a driver with my referral link (USA only) to get best new-driver bonus available in your area. I may receive a commission for referring you. This page covers the most current Uber vehicle requirements and provides example cars to give you a sense for the kind of cars that qualify for each of the various Uber services. It’s important to note that each Uber market might have slightly different requirements that are subject to change, and Uber ultimately holds the right to determine whether you can drive or not. Want to apply to drive? You don’t need a car to apply! Apply to drive for Uber (USA only) with my referral link and you’ll be eligible for the best new-driver bonus in your area. I may receive a bonus from Uber if you use my referral link to sign up. This post is a general guide to introduce you to Uber’s vehicle requirements. If you think your car qualifies, the next step is to apply to drive. It doesn’t take very long to find out if your car will be accepted. UberX is the lowest-cost Uber service. Almost any 4-door vehicle that is model year 2007 or newer will qualify as long as it is in good mechanical and cosmetic condition. The majority of ride requests are for UberX rides. Example UberX cars: Toyota Prius, Honda Accord, Mazda3 and Mazda6, Toyota Camry and Corolla, Ford Focus, Nissan Altima, Nissan Sentra, Ford F-150, Toyota Tacoma, Honda Civic, Chevrolet Malibu, Chevrolet Cruz, Chevrolet Cobalt, Volkswagen Golf, Volkswagen Passat, Chrysler 300 and 200. UberXL is a service intended for groups of 5–6 passengers. Fare rates for XL are much higher than X, so you’ll make more money per ride if you drive an XL vehicle. UberSelect gives riders the option to get a ride in an entry-level luxury vehicle with a leather interior. Select costs more than UberX and XL. The high-end, high-cost Uber service that has the highest vehicle and driver standards. A luxury car service that only accepts the top models from luxury brands. UberEATS is an on-demand food delivery service that has more lenient vehicle requirements. The main difference is that UberEATS accepts vehicles with 2 doors, and the vehicle can be as old as model year 1999. Read more about driving for UberEATS here. What does the Uber vehicle inspection cover? Before you can begin accepting ride requests, you’ll have to have your vehicle inspected. You can have your vehicle inspected at a local Uber vehicle activation center, or at a state-certified mechanic in your area. Inspections at Uber activation centers are free, and mechanics typically charge around $20 – $30 for an inspection. The inspection covers the basic mechanical condition of your car: Brakes, tires, lights, windows, and safety features are inspected. See the Uber inspection form for the full checklist. To find a free inspection center, visit uber.com/drive/*your-city* (example: uber.com/drive/los-angeles/). From there, you’ll find inspection locations in the Vehicle Inspections area or Local Resources area. Will your car pass the Uber vehicle inspection? Uber doesn’t make it easy to find the exact model year requirement in your city. Uber only displays very general requirements on the Uber driver application. And when you google search for the requirements in your city, you might find confusing, unclear results. For now, that’s the best way to go directly to the model year requirement in a specific city. You may need to go to uber.com/cities to see how your city is displayed in a URL. If you drive for Uber with a vehicle that is eligible for UberXL, Select, or other Uber services, by default you’ll get requests for all of the services that your vehicle is eligible for. For example, if you drive an SUV that qualifies for XL, you will receive UberX and XL requests. 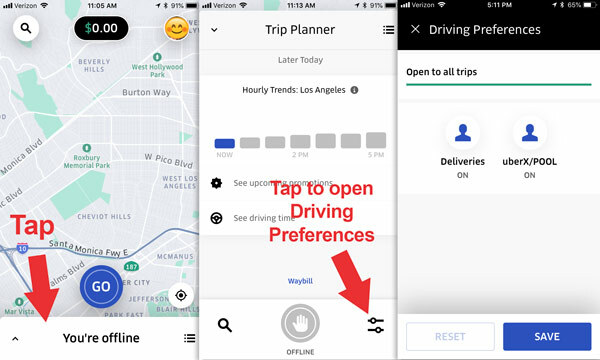 You can select which types of trip requests you receive by visiting the Driving Preferences menu in the Uber app. Tap the bottom area of the home screen to open your Trip Planner. Then tap the icon in the bottom right to open Driving Preferences and tap on a service to enable or disable requests from that service. The volume of UberXL and Select ride requests is typically much lower than the volume of UberX rides, so most drivers accept ride request from all Uber services. What happens if your car can becomes too old for Uber? Uber updates their model year requirements once each year, so it’s possible for your car to age out of Uber’s system. You won’t be able to go online with that vehicle when it becomes too old for Uber. Uber calls the process ‘vehicle transitioning,’ a nice way of saying your car no longer qualifies. What happens when your car becomes too old for Uber. The best way to find out if your car is new enough to drive for Uber is to to go Uber.com/drive/*your-city* (EX: uber.com/drive/los-angeles/). From there, visit the Vehicle Requirements page to see the current model year requirement for your city. Ultimately, the only way to find out if your particular car qualifies is to go through the application process. After you let Uber know what kind of car you have and provide basic personal information, you’ll be told if you should move forward to complete the background check and vehicle inspection. If you pass those, you’ll be cleared to drive. I have a 2017 Hyundai Veloster. It has 5 seatbelts and 4 doors including hatchback. is my car elgible?? I had the engine replaced and electrical wiring cleaned and replaced bad wires in a 2002 Lincoln car model, would I still need to get a new car or would it be acceptable if i send in copies of repairs done to the car as its only been driven 87,000 miles? Uber won’t make any exception for the model year requirement. 2002 is too old, unfortunately. You’ll need a newer car. Uber doesn’t mention the following vehicles: Nissan Versa, Hyundai Accent, Elantra and Sonata. These are 4 door cars. So are the Toyota Avalon and Yaris. I inquired about a Nissan Armada as a Premium vehicle as well as a Toyota Sequoia. I was told no on the Toyota and haven’t heard about the Nissan. I have since seen a Sequoia as well as a VW Atlas driving Premium platform. Where can I find a complete list of acceptable vehicles in South Carolina for Uber Premium and XL? Here are the vehicle requirements for Charleston. I don’t see any Toyota or Nissan listed. I need to upload the “brake tag – back” and I am not sure what document that they are referring to. Please advise if you can.